Genome inheritance in sexually reproducing organisms requires the accurate formation of haploid gametes from diploid germ cells. This halving in chromosome number is achieved during meiosis, a specialized cell division program that involves the coordinated execution of the following chromosomal events: pairing of homologous chromosomes, the formation of inter-homologue crossover events during meiotic recombination, and the step-wise dissolution of sister chromatid cohesion during the two meiotic divisions. Defects in any of these processes result in the formation of aneuploid gametes, one of the leading causes of miscarriages and birth defects in humans. The main goal of our research program is to understand the molecular mechanisms that ensure the proper execution and coordination of the different chromosomal events of the meiotic program. 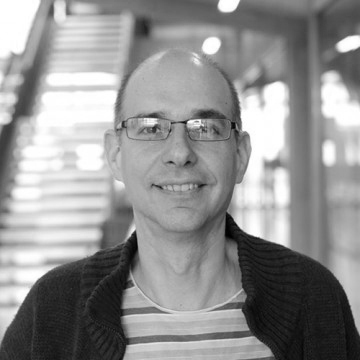 We are particularly interested in understanding how cohesin, the protein complex that mediates sister chromatid cohesion, and a group of HORMA-domain proteins that are also fundamental components of meiotic chromosomes, promote crossover formation and accurate chromosome segregation. To this end we are using C. elegans, a model organism especially well suited for the study of meiosis, and a combination of experimental approaches that includes genetics, biochemistry, proteomics, three-dimensional microscopy and live imaging of meiotic chromosomes. 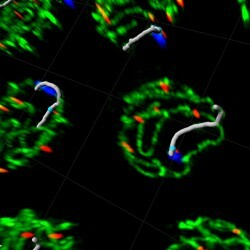 Imaging of meiotic chromosomes using 3D super resolution microscopy. Axial elements are visualised by labelling of HORMA-domain protein HTP-3 (green), crossover sites are identified by foci of COSA-1 (red), while X chromosomes are labelled with anti-HIM-8 antibodies (blue). Using this approach, it is possible to trace individual chromosomes along their entire length (grey rods indicate paired X chromosomes). Ferrandiz N, Barroso C, Telecan O, Shao N, Kim H-M, Testori S, Faull P, Cutillas P, Snijders AP, Colaiacovo MP, Martinez-Perez E. (2018). Spatiotemporal regulation of Aurora B recruitment ensures release of cohesion during C. elegans oocyte meiosis. Nature Communications 9, 834. Görlitz F, Guldbrand S, Runcorn TH, Murray RT, Jaso-Tamame AL, Sinclair HG, Martinez-Perez E, Taylor JR, Neil MAA, Dunsby C, French PMW. (2018). easySLM-STED: Stimulated emission depletion microscopy with aberration correction, extended field of view and multiple beam scanning. Journal of Biophotonics 2018, (0), p.e201800087. Link J, Paouneskou D, Velkova M, Daryabeigi A, Laos T, Labella S, Barroso C, Pinol SP, Montoya A, Kramer H, Woglar A, Baudrimont A, Markert SM, Stigloher C, Martinez-Perez E, Dammermann A, Alsheimer M, Zetka M, Jantsch V. (2018). Transient and Partial Nuclear Lamina Disruption Promotes Chromosome Movement in Early Meiotic Prophase, Developmental Cell 45, 212. Hillers KJ, Jantsch V, Martinez-Perez E, Yanowitz JL. (2017). Meiosis. WormBook 2017, 1-43. Crawley O, Barroso C, Testori S, Ferrandiz N, Silva N, Castellano-Pozo M, Jaso-Tamame AL, Martinez-Perez E. (2016). Cohesin-interacting protein WAPL-1 regulates meiotic chromosome structure and cohesion by antagonizing specific cohesin complexes. eLife 5: e10851. Gao J, Barroso C, Zhang P, Kim H-M. Li S, Labrador L, Lightfoot J, Gerashchenko MV, Labunskyy VM, Dong M-Q, Martinez-Perez E, Colaiacovo MP. (2016). N-terminal acetylation promotes synaptonemal complex assembly in C. elegans. Genes & Development 30(21), 2404–2416. Silva N, Ferrandiz N, Barroso C, Tognetti S, Lightfoot J, Telecan O, Encheva V, Faull P, Hanni S, Furger A, Snijders A, Speck C, Martinez-Perez E. (2014). The Fidelity of Synaptonemal Complex Assembly Is Regulated by a Signaling Mechanism that Controls Early Meiotic Progression. Developmental Cell 31(4), 503–511. Labrador L, Barroso C, Lightfoot J, Müller-Reichert T, Flibotte S, Taylor J, Moerman DG, Villeneuve AM, Martinez-Perez E. (2013). Chromosome movements promoted by the mitochondrial protein SPD-3 are required for homology search during Caenorhabditis elegans meiosis. PLoS Genetics 9 (5), e1003497. Lightfoot J, Testori S, Barroso C, Martinez-Perez E. (2011). Loading of meiotic cohesin by SCC-2 is required for early processing of DSBs and for the DNA damage checkpoint. Current Biology 21, 1421-1430.